Up until late 1950s this part of the Hudson riverfront was occupied by five “finger piers”, replaced by a massive platform created between 1958 and 1962. With rectangular basis of 247x247 meters the platform was supported by nearly 3,300 H-shaped pillars. Operated by Holland America Lines, Pier 40 was able to service up to 4 ships at a time, with its central part (courtyard) being used as cargo parking site. Three floors of parking, warehouse and office space was leased for 20 years, but America Holland relocated already in 1970s and by 1983 the pier was no longer used for passenger traffic. Following decades were spent on finding the optimal use, making it one of Lower Manhattan’s largest parking sites in the meanwhile. Finally in 1998 the Hudson River Park was created and the first sports field laid on the top floor. In 2005 the entire courtyard was covered with artificial grass, creating a vast playing area of 122x122 meters. This unusual shape makes it possible to host soccer, rugby and baseball events, though on a daily basis the area is divided into smaller fields for training purposes. There are no permanents stands for spectators, but guests may stand around and above the courtyard. Our capacity is of course only intuitive because Pier 40 doesn’t hold large-crowd events. 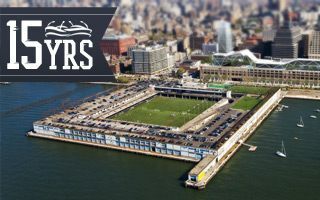 As years passed, Pier 40 not only became New York’s most central sports ground, but also proved the most popular public training venue across the island of Manhattan. The building generates $6 million in annual revenue, covering 30-40% of its budget. As for soccer/football tenant, it’s used by Downtown United SC, a satellite club for youth programmes of NY City FC. Already since 1970s there have been many visions of redevelopment. High-rise mixed with leisure, entirely green or semi-commercial areas were all expected to appear at Pier 40. In 2012 there even was an option by NY City FC to build their desired MLS stadium here. But as of now nothing was done to the original 1962 structure. Meet all 15 special stadiums added for our 15th anniversary!